Is this the coolest thing ever done by a high school teacher? Ever wonder how to get your school noticed worldwide and become the coolest high school teacher ever overnight? 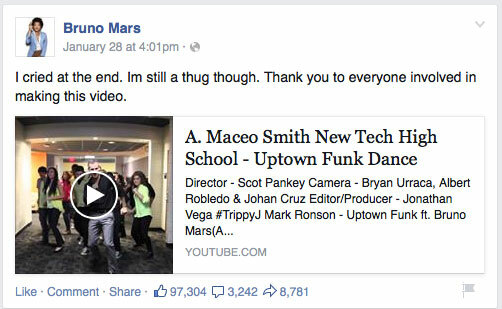 Recently (January 2015) theatre teacher, Scot Pankey and his 200 students did just that – not with some fancy computer school program or high maths or english test scores, but with one single music clip where he and his students danced in the halls to Uptown Funk by Mark Ronson featuring Bruno Mars. Pankey told the Dallas Morning News “I heard the song before Christmas and fell in love with it,” “We are a project-based school … You give the students a project, put them in teams, and they have to come up with solutions. They had three weeks to work on it, then present as a group what they learned.” Each class was dressed in a different coloured top and they choreographed their own segment. It turns out it was all done by him and the students. Pankey explained that three students filmed it altogether. One held the camera and two others were pulling him on a library cart. When they got to stairs, the student holding got off the cart and walked backwards (which may explain the slightly shaky video) , hopped back on the cart and the rest is- history! So he must be a skilled dance teacher…right? Mr Pankey explained the impact on the whole school was enormous. He said the day when Bruno Mars tweeted about it and then posted a comment about it on facebook was like the whole school was floating! To me this video captures what the arts do for any school or community. Out of all the subject opportunities and and special teachers that this school obviously has or does, it wasn’t the technology or the high science,english or the maths scores that got it noticed- even though it’s a tech school. All those skills are obviously there, but it was communicated through the arts. This video I feel serves as powerful advocacy for any arts program in any school… this technology school was noticed on a worldwide level via the arts. “If you really want to communicate with someone you don’t use science. Science is an organization of curiosity and ideas—and you have to talk about how you organize it, about the scientific method, you have to understand fundamentals because while it can be artistic, you can’t build a Blackberry device artistically—but art is a fundamental way to express the wonder of being human. If you really want to communicate with someone, it’s best not to show a graph, but to express something artistically.”- Col. Chris Hadfield, Canadian Astronaut. I realise this is just my perspective and it’s only the beginning of the whole “Importance of Arts in Schools” conversation. Now I’d love you to continue the discussion using the comments below. Tell us your perspective on the “Importance of the Arts in Schools”. Do you think this guy is the coolest high school teacher ever? Tell us the coolest thing you’ve ever seen or done as a teacher- the whole teaching community would love to learn from and see what you share and every perspective is valid!